• For quantitative determination of lipase activity. • LIPASE catalyzes the hydrolysis of ester bonds on the glycerol backbone of a lipid substrate. In humans, pancreatic lipase is the key enzyme responsible for breaking down fats in the digestive system by converting triglycerides to monoglycerides and free fatty acids. Human pancreatic lipase and its related protein 2 are the main lipases secreted by the pancreas. In acute pancreatitis, lipase levels can rise 5 to 10-fold within 24 to 48 hours. Increased activities have also been associated with pancreatic duct obstruction, pancreatic cancer, kidney disease, salivary gland inflammation, bowel obstruction, and other pancreatic diseases. Decreased levels may indicate permanent damage to lipase-producing cells in the pancreas. 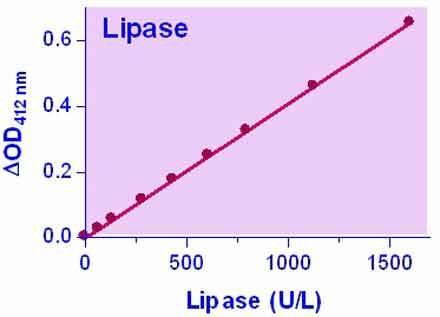 Simple, direct and automation-ready procedures for measuring lipase activity are very desirable. BioAssay Systems QuantiChrom™ Lipase Assay is based on an improved dimercaptopropanol tributyrate (BALB) method, in which SH groups formed from lipase cleavage of BALB react with 5,5?-dithiobis(2-nitrobenzoic acid) (DTNB) to form a yellow colored product. The color intensity, measured at 412 nm, is proportionate to the enzyme activity in the sample. 1. Can this kit be used to measure lipase activity in cooking oil? No, we tested it with one oil sample (Sicilian Selezione Extra Virgin Olive Oil). We mixed 600 µL WR with 400 µL oil (control 600 µL WR alone) and shaked for about 4 hrs. We did not see difference in color between control and sample. 2. Can this kit be used to determine phospholipase activity (phospholipase C)?